Rasboras are schooling fish and are happiest in groups of six or more. Averaging about two inches in length, they get on well with other schooling fish of about the same size. For best results, keep them in a densely planted tank with plenty of hiding places. They like slightly acidic water, so bogwood is also a good choice, providing cover and lowering the pH of the water at the same time. Make sure there are some floating plants on the surface of the water so that your rasboras feel more secure. They can become distressed if directly exposed to bright light for too long. Rasboras are not easy to breed, but if you are patient and give them plenty of attention you can expect to be rewarded. Sexing them is fairly easy - females are larger and more full-bodied than males, and the markings on males tend to be more angular. If you watch your shoal of rasboras carefully you will soon identify couples forming within it. Rather than stress them when they are just about to spawn, you should move a suitable couple into a separate spawning tank as soon as they start to become physical with each other (close swimming, chasing and nudging in the belly). The spawning tank should be heavily planted with a gravel substrate, providing plenty of places for sticky eggs to attach. Spawning will begin first thing in the morning and you should remove the parent fish immediately afterwards, as they will eat their own eggs. Once the adult fish have been removed, their eggs should be kept in the dark to protect them from fungus. 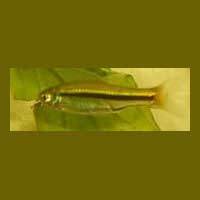 Rasbora fry can be difficult to rear. They will accept most commercial fry food preparations but should not be given infusoria, which can damage them. With luck, you can expect to raise about ten fry to maturity from each clutch of two hundred eggs. Ihave two shrimps in my tank twice she has bred but the babies are so small but i have been told it must be good tank for her to breed. I also love fish especcialy rasbororasgot so many different types.